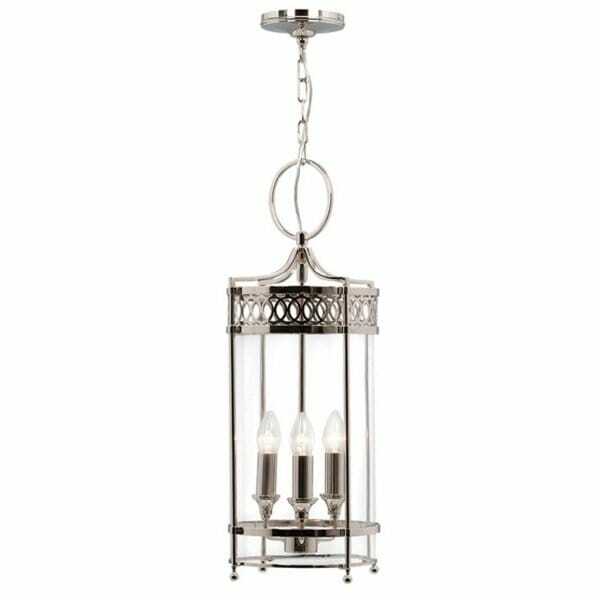 A classic design Georgian hall lantern available in a choice of 3 finishes - shown here in the polished nickel finish. The Guildhall ceiling pendants are elegant period lanterns ideal for hallways, entrances and rooms that have original Georgian features. The lantern has a long drop of over 1.2 metres making it a good choice for lighting entrance hallways with a high ceiling. A circular ceiling lantern supported on a chain from a circular polished nickel rose. This is a quality made light fitting where attention is paid to detail. The lantern has decorative detailing on the border around the top of the frame and the clear glass allows the maximum light out into the room. The three upward facing lights have polished nickel candle drips and sconces.